Perfect,deep down daily cleansing. This frequent use shampoo respects the hair and scalp's natural condition. Suitable for any type of hair. Natural pomegranate extract: a natural source of polyphenols,vitamins from groups A,B and C and natural minerals such as zinc. 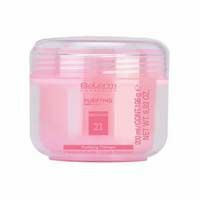 Protects the hair and skin from photo-aging and skin irritations. Regulates sebum gland secretions. 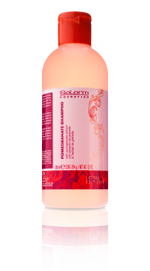 Polyquaternium-11/cocamidopropyl betaine: a combination of a quarternized conditioner and an extremely gentle surfactant that allow deep down cleansing that’s gentle on the hair and scalp. Floral top notes that evolve into a fruity scent predominated by strawberry and pomegranate Apply to wet hair. Massage gently to form a lather. Rinse with warm water. Repeat. After massaging in rinse again.